JET8 is a Singapore-based, global social media platform with technology that allows brands, agencies and influencers to engage and sell to social communities through user-generated mobile content. Using JET8’s social currency, JETS, users of JET8 apps are rewarded for their influence as they engage with the brands and communities they love. For every in-app like, comment, and share, users earn JETS, which can be used to redeem products online or over-the-counter across more than 15,000 retail stores around the world, including Watsons and 7-Eleven. 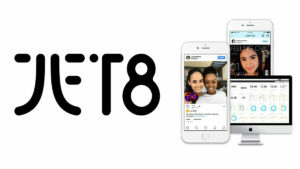 With over 15 million app installs across Southeast Asia and South Africa, JET8’s Fotoku app enables users to share branded selfies and videos with their followers across multiple social media platforms. JET8’s APPaaS (application as a service) offers brands customised, white-labelled apps that enable reciprocal engagement with customers, fans, contributors, and citizens. From sports clubs, to music festivals, to non-profit organisations, customised apps create new and unique commercial opportunities for brands, maximising return of investment. In addition to Fotoku and APPaaS, JET8 offers user data exchange and social sampling. ollowing the launch of the J8T token in March 2018, the JET8 platform is fully integrating onto the blockchain to enhance accessibility, diversity, transparency, and service efﬁciency, allowing users content ownership and transaction security in a decentralised marketplace. The JETS social currency allows anyone, anywhere to buy into JET8 technology. By decentralising system architecture and integrating features and transactions onto the blockchain, JET8 is creating a more democratic model for influencers, users and brands – making content creation and user-related data exchange transactions fair and accountable to all parties. The JET8 peer-to-peer network launched in 2015 and is currently utilised by over 50 global brands and marketers including Procter & Gamble, Unilever, Nestle, Coca-Cola, Pepsi and McDonald’s.